In this blog post we show how to use nginScript to implement a graceful switchover to a new application server. Instead of taking a disruptive “big‑bang approach” where everything is transitioned all at once, we define a time window during which all clients are progressively transitioned to the new application server. In this way, we can gradually – and automatically – increase traffic to the new application server. We’re defining a two‑hour window during which we want our progressive switchover to take place, in this example from 5 to 7 PM. After the first 12 minutes we should expect 10% of clients to be directed to the new application server, then 20% of clients after 24 minutes, and so on. The following graph illustrates the transition. In this example we are using NGINX or NGINX Plus as a reverse proxy to a web application server, so all of our configuration is in the http context. For details about the configuration for TCP and UDP applications in the stream context, see below. First, we define separate upstream blocks for the sets of servers that host our old and new application code respectively. 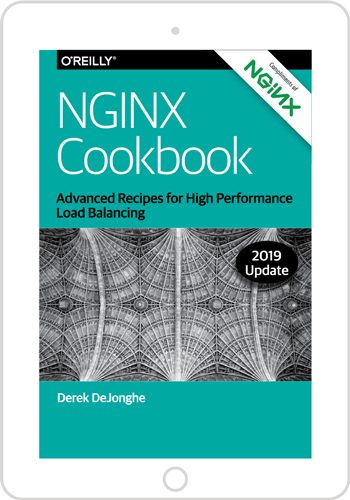 Even with our progressive transition configuration, NGINX or NGINX Plus will continue to load balance between the available servers during the transition window. Next we define the frontend service that NGINX or NGINX Plus presents to clients. We are using nginScript to determine which upstream group to use, so we need to specify where the nginScript code resides. In NGINX Plus R11 and later, all nginScript code must be located in a separate file and the js_include directive specifies its location. The js_set directive sets the value of the $upstream variable. Note that the directive does not instruct NGINX or NGINX Plus to call the nginScript function transitionStatus. NGINX variables are evaluated on demand, that is, at the point during request processing that they are used. So the js_set directive tells NGINX or NGINX Plus how to evaluate the $upstream variable when it is needed. The server block defines how NGINX or NGINX Plus handles incoming HTTP requests. The listen directive tells NGINX or NGINX Plus to listen on port 80 – the default for HTTP traffic, although a production configuration normally uses SSL/TLS to protect data in transit. We assume that you have already enabled the nginScript module. Instructions appear at the end of this article. We put our nginScript code in /etc/nginx/progressive_transition.js as specified by the js_include directive. All of our functions appear in this file. Dependent functions must appear before those that call them, so we start by defining a function that returns a hash of the client’s IP address. If our application server is predominantly used by users on the same LAN then all of our clients have very similar IP addresses, so we need the hash function to return an even distribution of values even for a small range of input values. Next we define the function, transitionStatus, that sets the $upstream variable in the js_set directive in our NGINX configuration. The outer if/else block determines whether the transition window has started, finished, or is in progress. If it’s in progress, we obtain the hash of the client IP address by passing req.remoteAddress to the fnv32a function. We then calculate where the hashed value sits within the range of all possible values. Because the FNV‑1a algorithm returns a 32‑bit integer we can simply divide the hashed value by 4,294,967,295 (the decimal representation of 32 bits). 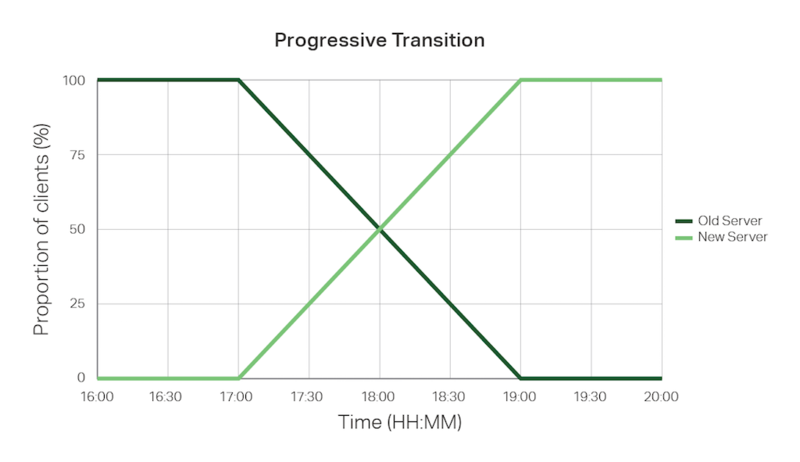 Finally, we compare the hashed value’s position within the output range with our current position within the transition time window, and return the name of the corresponding upstream group. The sample configuration for HTTP applications in the previous section is appropriate when NGINX or NGINX Plus acts as a reverse proxy for an HTTP application server. We can adapt the configuration for TCP and UDP applications by moving the entire configuration snippet to the stream context. Then reload the NGINX software as directed in Step 3. We will continue to extend and enhance the capabilities of nginScript to support ever‑more useful programmatic configuration solutions for NGINX and NGINX Plus. In the meantime, we would love to hear about the problems you are solving with nginScript – please add them to the comments section below. To try out nginScript with NGINX Plus yourself, start your free 30‑day trial today or contact us for a live demo.